Back when D&D turned 40 in 2014, I put up a post about the date I favored for celebrating its anniversary: the last Sunday in January. 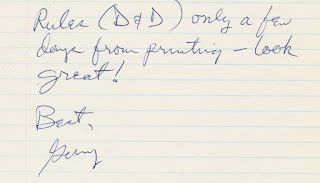 Today, January 27, is the last Sunday in January 2019, and the day that I will be tipping a glass to Gary Gygax, Dave Arneson, and the many others who made D&D possible 45 years ago. 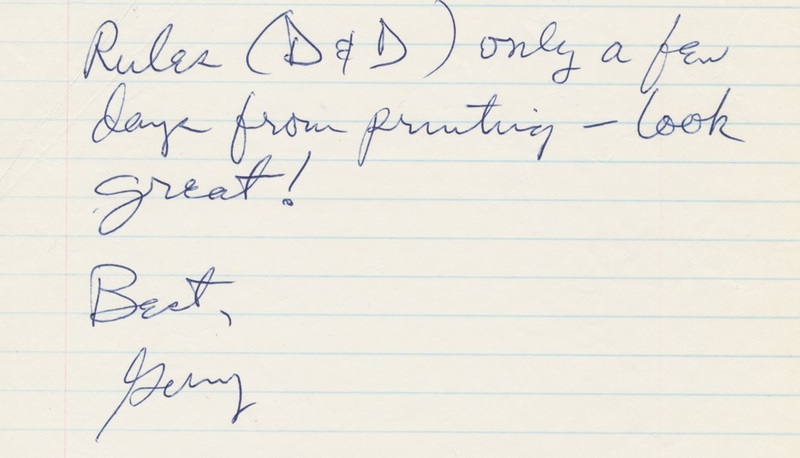 Above is an excerpt from a letter that Gygax sent to Arneson -- as it reads, just days away from the printing. I've noticed that a few people have adopted January 26 as the anniversary of the publication of D&D, as that happened to be the last Sunday in the month of January back in 2014. I favor a Sunday because it was on Sundays that Gygax invited people to come to his house to trial the game, as I mentioned in my earlier post. But my whole point was that there isn't a lot of precision to be found in dating the release, so celebrating a few days earlier or later doesn't do any harm from my perspective. 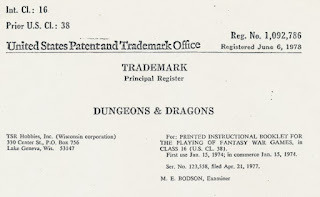 Speaking of a few days later - a couple years after the release of D&D, when TSR finally got around to registering the game with the copyright office, their filing gave a date of January 30, 1974. Should we go with that date instead? This date may have just been picked in 1976 to reflect when the game was roughly available; it seems unlikely that there was any moment, back in the informal days of January 1974, when the principles of TSR solemnly declared, "a moment ago this work was not copyrighted but now it is." Copyright law (before the Copyright Act of 1976) allowed these things to be pretty loose. We know that some of the other registrations done after the fact in this era are unreliable: the one for Greyhawk (1975) is about two months off. Moreover, the question of when the text was actually proofed and complete, and thus copyright-able, is distinct from when the game was actually printed, when it was available for order, and when the first copy was actually put together and handed out. For example, the trademark date, when they bothered to file that in 1977, states that the game was "in commerce" as of January 15, 1974. Does that mean it was out then? Or just available for order? Or is it just another date that was picked retrospectively to reflect the game's availability around January? The way I see things today, I think it's unlikely many people had copies of the game in hand before February. But still, the last Sunday in January is the day I at least honor the anniversary. Think back to when Gygax wrote those words above, about D&D being just days away from printing... and just how far the game has come since. Jan 30 makes the most sense to me. The idea was in fruition by January's end by my observation of what's presented. I fully support January as memorial/celebration month. I'm sure copies for view were available, and I'm sure Gary gifted them to those that had a passion for the game. So many layers and stages to productions, that changes over the years to be sure. Now print by demand alters a few hard datelines for availability. I'm sure either way we are doing right by Gary. Ironically, the 27th was the last Sunday in January in 1974 too. Personally, I celebrate the birth of D&D on November 25th. January 27th was indeed the last Sunday in 1974 and also 6 months either side of Gary's birthday, so I think that works on a couple of levels. I’ll personally choose to believe 30 Jan as the birthday of D&D. I may be biased, seeing as how my birthday falls on the 30th. I'd suggest a 16-day birthday fete lasting from Jan 15 (D&D Trademark Day!) to Jan 30 (D&D Copyright Day!). The 16 Days of D&Dmas. Probably the greatest thing made in 1974 next to myself. I was born on the 6th of January of 74' & live that I've been around as long as D&D ... Surely it will be here long after I'm gone. 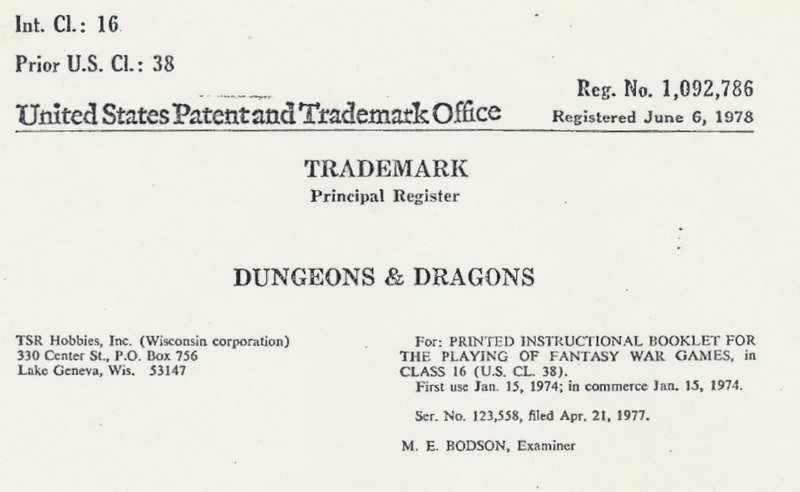 If Gygax and Arneson claimed to begin using trademark on product as of 1/15/74, and the U.S. Patent office believed this enough to type it out as such on the trademark license, then how do those of us who weren't there have any grounds on which to dispute it? The authors know more than we did, and the U.S. Patent office believed them... why can't WE (their supposed fans) believe them?!? January 15th, 1974 seems the most plausible and concrete date IN WRITING ON AN OFFICIAL DOCUMENT as the official birthday of D&D. But it was written years later. This is far from the first instance I've seen of a totally inaccurate date on a trademark application, usually due to how long afterwards it's submitted. Also Arneson was gone from TSR in 1978, so it's not his word at all. Hey Jon, long time! Have you ever heard of the Warlock variant of D&D? It was a CalTech "fork" with pretty different rules, and was -- unsurprisingly -- more complicated. I have a pdf of the Complete Warlock somewhere around here.